Monthly Key West Vacation Rental Off Duval St.
23/24: Front balcony view of Simonton St. 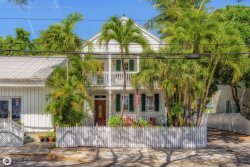 Discover Conch Easy LIvin' at this monthly vacation home in the heart of Old Town Key West! You'll get a real feel of the Keys in this traditional Conch style house located just one block from famous Duval Street where you'll be close to the action but still have a quiet oasis to return to. This house comes fully furnished with all the amenities you'll need for a month or multi-month stay including private pool, gourmet kitchen, off-street covered parking, bikes for guests to use and more! Enjoy taking in the views of the neighborhood on one of the two front porches and then retire to the private garden patio surrounded with lush vegetation, where you can take a dip in the heated pool, catch some rays, grill out or relax in the shade under the covered area. Finish with an outdoor shower under the stars to make the day complete. Inside, the dining and spacious living area features a large flat screen cable TV, dining room table, lots of comfortable seating with sliding glass doors out to the pool and patio. There is also a first floor bathroom with shower for your convenience and the living room couch can be converted to a sleeper sofa. The kitchen has granite countertops and a breakfast bar along with full size refrigerator, stove, microwave, toaster, Keurig coffee machine, dishwasher, blender and all your cooking utensils / necessities. Upstairs there are two large bedrooms. The master bedroom has a king bed, two closets and private bathroom with shower and separate tub. The second bedroom has two queen beds, closet and its own bathroom with shower. The washer and dryer is also located in the second floor hallway. This property has everything you need to enjoy the perfect Key West vacation. Close walking distance to incredible restaurants, historic bars, art galleries, cinema, shopping, grocery and liquor stores. Take the bikes for a short ride to the beach, Key West Seaport or just a sight seeing tour. The Duval Loop bus also has a stop right next door and provides free rides around the Duval Street areas.